We have now entered the cycle of rebirth once again. The New Moon in Cancer promises to assist us to bring forth into our lives all that we have acquired through the previous cycles. The journey that we are experiencing is intertwined with many challenges. The Summer Solstice has allowed us to bring forth more light infractions within our existence. This represents a New Beginning, a new moment in time for each of us. New Moon energies are always wonderful as they bring to us the promise of letting go of the old moments that have been helped us to embrace the challenge of the old and accept that we can start afresh. It is a time of great acceleration. The sign of Cancer is such a loving energy that this moon represents the ability to go deeper into our self awareness and find the inner security that we have been looking for. As humans, we can spend so much time in looking at how we are making mistakes and not finding the fulfillment that we deserve to have in our lives. The energies of Cancer helps us to create these moments of love and pure expression of light that we are. It is a time of self-nourishment and to look within ourselves of how we become strong and loving in our existence. Take time during this cycle to embrace the Divine Being that you are. 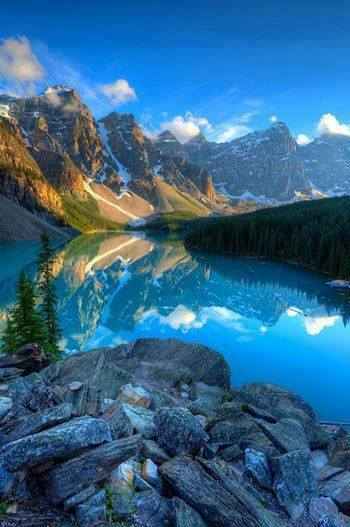 Look within to reflect how far you have come and take a breath of fresh air. See your moment of arrival from your recent past into the present moment. We are at the end of the Mercury Retrograde cycle so it is a very important time to reflect on who we have become through the journey of the self. Note, Mercury goes direct on July 1st which allows for this moon cycle to truly help us to look deeper within the core of our being. It is the time to truly make the necessary changes in our outside world by accepting our divine love within ourselves. We are now within the summer months with the Solstice fully behind us, it is time to take what we have learned and fully ground it into our present pathway. This can be quite challenging when we have so many festivals and planetary activations happening to us. It has been way too long since I have written about my own experiences of my ascension process. I feel that when I share honestly about who I am and how I am changing, that it helps others to understand more about themselves. The energies presently are going to become very commonplace in our world even if it is a challenge for each of us to understand what we are experiencing as the changes within us affect our lives directly. Isn’t this what we all desire ~ to move towards the New Earth? But how, do we keep the stability within ourselves as we connect to our Higher Essence in a deeper level than we did in a previous moment. It is no mistake that what we are experiencing as Lightworkers, Initiates, and walking into ascended mastery on this plane of existence is beyond what we could ever imagine. But each of us has chosen it. We came to this earth with a contract to fully experience life through our multi-dimensional self. What we did not want to admit on the Innerplane level is that it would be much more challenging than our angelic self wanted to accept. This is exactly what we are experiencing within these present moments. We meditate, we work with the higher energies, we ask for activation upon activation to assist us to become our Higher Self and more, but yet the physical body can react very adversely as the changes occur within us. How do we handle this process within the reality of our mind and emotions? These are all important considerations as the reality that we once knew is changing quickly. 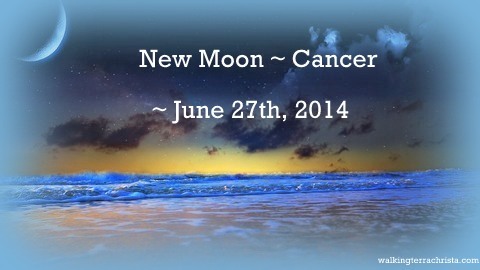 The planetary activations of each New Moon and Full Moon can affect us in many different ways. We just passed through three amazing festivals, the Christ, Wesak, and Humanity or Goodwill. Then we come upon the Summer Solstice when the light frequencies are coming in more intensely through the Great Central Suns to GAIA. We are the conduits of this light, but yet how do we sustain ourselves so that we can accept the totality of our essence within our physical vehicle so the lands of GAIA can arise to the occasion? The answer to all of these questions is understanding who we are in each moment. As we change with each new level of vibration that comes within us, we must accept the fact that we are not ‘who we were before.’ We have to learn how to retrain ourselves from our thoughts and emotions into a higher existence ~ our Higher Mind and Heart through the Higher Self. Our lives will never be the same and isn’t this what we have all asked to happen? We desire to be in a world of complete Divine Love and Oneness but first we must accept it within ourselves. The effects of the Festivals of Light with Wesak are not truly understood for three months thereafter. That takes us through the months of June, July, and August. This is the time of our true grounding of our higher essence that was brought into our reality during Wesak. So we have to take advantage of this time and fully understand the process that we have been experiencing. So how do we go about knowing who we are? Being in silence; stepping into ourselves with our breath and feeling our entire Beingness. What does this feel like? Do you feel the bliss, the joy, serenity, and just happy to be with yourself? Or does it feel very uncomfortable, starting to express frustration or agitation? These are the different realities of the Light and the Dark within us. It is important for each of us to understand ourselves completely in each moment. It is how we are working through our soul contract of helping Mother Earth find her divine self, of Terra Christ. Each of us has this responsibility within ourselves to achieve this essence. When we don’t, then we are only hurting the planet and everyone around us. At the present time, we are being challenged to continually understand who we are in each moment. It is our responsibility as a soul to fully allow our higher essence to be our guide, but it takes great practice and diligence to do so. Each individual must learn to ground it and this means taking the higher energy You Are and bringing it down through all your chakras, into your feet, connecting with your Earth Star. This process will help you to heal yourself, command the energies that are your Divine Right and fully be in Oneness with your Higher Self, and I Am Presence. Each of us has changed in the last couple of months. It is part of the process with the Wesak energies so that we can be more to our physical self and to others. It is how we give service but first and foremost, it must be acquired within. This is a big challenge to continually look within our inner heart and see what needs to be changed in order to receive what we truly deserve upon this Earth. My life as being a mentor and teacher has been challenged greatly in the past couple of months, especially the last few weeks. I have learned through this process of the Festivals that my role to others is to show to myself who I have become. This is a huge moment to accept the fact that you are the Voice of the Spiritual Hierarchy and to share with others about this. It has always been my role to share the messages of Spirit but not talk about how I arrived in this space or the challenges I had to go through to own who I am. All of that has changed. This past week in our Clarion Temple of Oneness class we decided to bring for the Cosmic Great Central Sun energies in celebration of the Summer Solstice. This consciousness comes from combined essence Divine Mother and Father God. They also called upon all of the Great Central Suns from the Multi-Universal Level through the Universal, Galactic, and Solar Levels combined essences to help humanity to receive the attunements of their light for the balance of the light infractions that we received for the Solstice. There was also a lot that they did not share, but the true fact was that I am their Voice. I was attuned since 2005 physically to accept their energies within me so I could do this work. I now have a wonderful partner that helps me to ground it within me and through others so that each individual that listens to these attunements can become closer with their essence as I have been able to do. It does not matter that I have accelerated myself through many initiations to be able to handle this energy. It is a physical experience for me in these present moments. When any of the Spiritual Hierarchy comes to me, we are intertwined. They have full control of my voice, but I am part of the experience. They utilize my gifts of shamanism, intuitiveness, utilizing my sight, hearing, and the acquisition of all that I have acquired through the years. The chanting that I do comes from the highest level of frequencies within the 144 dimensions of light. Sometimes it can be very challenging for me physically before a call and definitely afterwards. We now call my work “Fully Integrated Transmitter” as I am no longer just a channel. I am One with all of these Beings within the Unified Whole Command. I know that each person is affected with each of these classes; and I know all individuals will not accept it within themselves. This is why this is a planet of Free Will. This is quite a statement for me to convey to the world, but it is time to do so. This is my acceleration of Wesak 2014 and the Solstice has helped me to acknowledge it deeply within my Being. It is also a challenge because any other energies that come to me from others, thought forms, or dark energies effect me tremendously. During the transmission I am in a power space, but returning from these transmissions can truly debilitate my energies if there are lower forms of projected towards me. This is part of the 4th dimension that we are living within presently. I accept that process; I was a Shaman first so I am able to ascertain what does not feel right. I then cleanse, purify and allow my consciousness to come back to where I have achieved it ~ a sense of pure love and joy. This also means that I cannot read other channelings anymore. I have to be careful where I search for things on the internet as the lower forces effect me immediately. This also means that after every session I do, I have to do a cleansing shower and remove any debris that has occurred in my outside field. Going into the 3rd dimensional world is a big challenge. I have learned to accept these rituals until this earth becomes the New Earth and every living being upon the planet will be within a 5th dimensional body. My role today in sharing this information is that we are in a world of great duality still. Many lightworkers share amazing messages and thoughts of love for this planet. This is so very important to do so. Every individual needs to assess themselves each moment. It is how we are going to heal this Earth into the New Earth. The vibrational frequency is more important presently than the words that we can share. This means that we at Walking Terra Christa are being guided by the Unified Whole and Spiritual Hierarchy to bring the highest teachings to individuals to help them through this process. We talk about the challenges of being on the mastery pathway. We live it everyday. That is why we are in Mt. Shasta. We could not exist anywhere else presently as our dimensional frequency could not handle a lower density. During the next three months each of us will change through the process. In order for us to affect Gaia’s progression it is important for each individual to understand what they are going through emotionally, mentally, and physically. In order to blend the three minds (Super Conscious, to Subconscious into the Consciousness) and accept the four body system as one fully body of light, we continually need to work at it in each moment. My suggestion is to take each day within your breath, feel what is happening for you, and allow your Higher Self to help you change the negative thoughts and programming that is still trying to stay within your physical body. Utilize the Rays of God in the spectrums of light to fully be infused within your being, break up the dis-ease that may still be lurking, and change it into the pure essence of light that you are. Also take some moments to see how much you have changed from May of this year until now. I guarantee you that there are some elements that have changed greatly within you. Allow your achievements to be known. You deserve to share it within our higher mind and heart. We can move to the 5th dimensional earth but everyone that wants to be on this pathway must be diligent in their studies and application to the Self. The one element that I have learned through this process is that the more that I accept my achievements, the deeper the healing within my physical body. Sharing my role through my writing is a huge event for me and even bigger for my Higher Ego. She is finally able to settle within me as I have been trying to allow this transition to occur for many years. I did not know that just by sharing who I am presently would change the composition that I hold within my physical vehicle. I have been trying to change it in a third dimensional way, and it was not fully being accepted within me. I now know that positive change is inevitable in all ways. 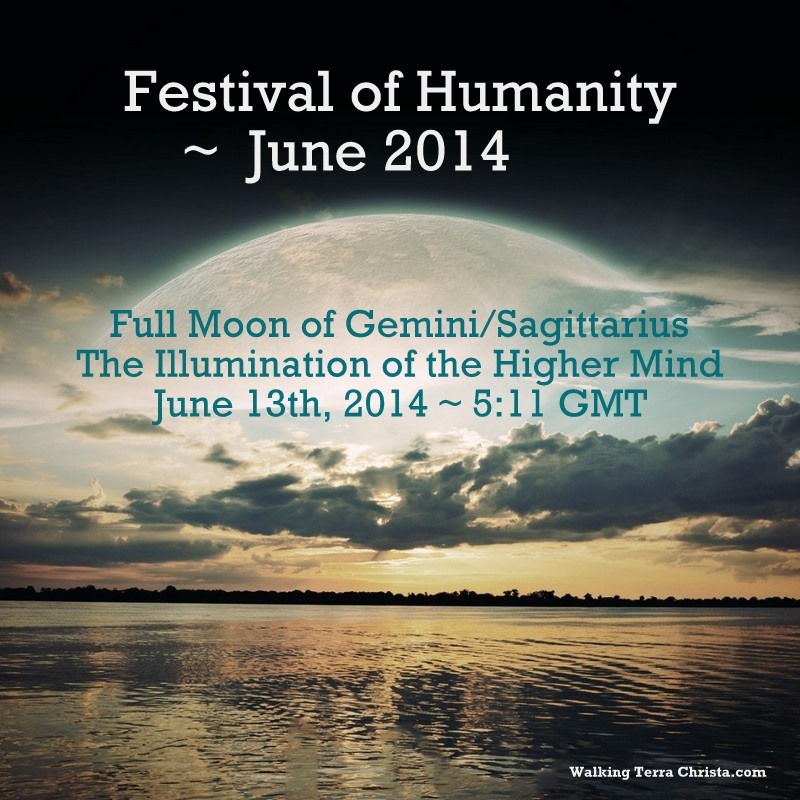 The Festival of Humanity has arrived on June 13th at 5:11 GMT (12:11 AM Eastern and June 12th, 9:11 PM Pacific) within the Sun of Gemini opposing the Moon within Sagittarius. This moon represents our Lower Mind of thinking logically battling the Higher Mind of our intuition and wisdom. This is the last of the ascension festivals which represents the ability to ground the higher levels of awareness and consciousness that we have received during the Wesak moon just one month ago. The time that has passed since Wesak has given us an opportunity to take those lessons we learned and understand what we have gone through in the process of our mastery pathway which may be a challenge to face within our present awareness. These energies will take us out of the reality we have been living under into a whole new perspective as we actively allow our Higher Self to be our ruling guide in each moment that we think, feel, and act upon this Earth. The Ray of Love of Wisdom within the color of Golden Yellow was activated through GAIA’s Merkabah Vehicle of Light during Wesak. It is now time for each of us to fully integrate not only this ray of pure love from our highest perspective but to be fully grounded with it along with the Blue Flame of Will and Power and the Ruby Red and Gold Flame of Inner Devotion. Life is changing on this earth; the integration of these powerful rays fully grounded will assist not only the entire planet but each individual to change their life path in a new and constructive manner. Our lessons will be centered upon each of the elements so that the choices we make will be reflected in every course of action we take. We are now at the stage to reconstruct our lives on the basic principles of the Divine Will being manifested within our world. This Wesak brought forth great changes in each of us. Some of them are manifested in our outside world or within ourselves. It does not matter which way it becomes obvious to each individual; the most important matter is allowing them to grow within us, change us to become the master we desire to be, and create our world accordingly. This is truly about giving service to this Earth. The aspects of this full moon only enhance the energetic exchange of this festival of light. It represents our ability to communicate more clearly with a different sense of attitude within us. It can create a sense of adventure in the actions that you take. Gemini shows us conflict within our logic and Sagittarius brings us the illumination that we desire. It truly helps us to bring forth the illumination of the Higher Mind to blend within the Lower Mind of the Physical Self so that there is more of a flow of ideas within our consciousness instead of the battling between the higher and lower energies within the self. It is important to take time during this full moon to activate your Higher Self within your physical existence by breathing in the Rays of God or Spectrums of Light. Connect with your Higher Essence to see what you may need to accept within your physical body so that these elements can be put into place within your pathway of light. Walking Terra Christa facilitated a Full Moon/Festival of Humanity Meditation Gathering Event with Lords Sanat Kumara and Kuthumi, as well as the Native Elders, in the Crystalline City of Havalanchee located in the Etheric Earth over Mt. Shasta, California. Lord Adama, High Priest of Telos spoke at the end to invite everyone who participates in the event to ask to come to Telos in their dream state to have a celebration there. Mel and Mike, the hosts for this magnificent ceremony, hope that individuals will choose to join them in celebrating and grounding these energies into Mother Earth by listening to the recording of the event. (Click here to listen). To register for future free open gathering events, please check the Walking Terra Christa website for registration details. To be fully integrated into GAIA. Igniting the Deep Blue Essence of Light. In her fully consciousness of the Merkabah Vehicle of Light She Is. Of all my timelines to be fully accessed. To understanding my Higher Self’s Journey Within Me. Our Higher Self, Monad, and I AM Presence. I send them unto GAIA’s Core of Light. As we Become One Beam of Acceleration Together. To be fully within all parts of my Being. As we Represent the One of the All. As I walk into a new doorway of Light.